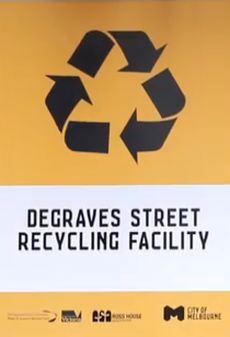 One of Melbourne's most iconic laneways, Degraves Street, has become a leader in dealing with waste. A new cooperative precinct based approach has created a business community with a sense of ownership and pride of their now cleaner, greener laneway. The project is a partnership between the City of Melbourne and the Metropolitan Waste Management Group, which shared the $550,000 cost of setting up the waste recycling facility. Operating from the basement of Ross House in Flinders Lane, the City said that the facility uses traditional recycling and high-tech machinery to reduce landfill and turn tonnes of organic food waste into compost-like soil conditioner and fertilizer. In addition, glass, plastics, aluminium, steel, paper and cardboard now gets diverted from landfill through the facility which are processed on site. Food service businesses also benefit from daily waste collections. The Degraves Street hub is a model that could be applied to other café and dining areas throughout other metropolitan areas.